A Granville man who was involved in a street fight while armed with two kitchen knives, has been sentenced to three months in jail. 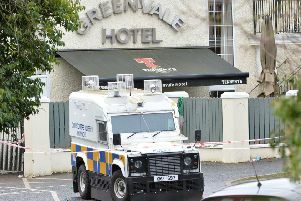 Appearing before East Tyrone Magistrates Court to be sentenced was Tomas Martinkus, 27, from Derryveen Crescent. Police described how, at 4am on November 15, they attended the scene of a fight between a large group of males. A report from a member of the public stated that one man has been seen with a knife. The constables searched the defendant and discovered two kitchen knives in his clothes. He claimed to have been at a barbecue that day but had been in bed when he had received a call stating that his brother had been assaulted. Martinkus got back into the same clothes, containing the knives, and made his way to the scene. Mr Noel Dillon, defending, told the court his client had a record of violence and that his claims should be “viewed with some scepticism”. “He was not at the party or part of the original disturbance. His brother was seriously assaulted. Mr Dillon disclosed that his client was in full time employment at a Donaghmore trailer company and asked that the court “not put his liberty and his job at risk” by sending him to prison. Deliberating over the sentence, District Judge John Meehan said: “The court takes a serious view of this matter. It is deeply disturbing to have people on the street in full violent confrontation. “Everyone is acutely aware that street fighting - especially when armed with knives - is extremely serious. “You were sentenced in the Crown Court to nine months for assault occasioning actual bodily harm in 2015. He then imposed a four month sentence which he reduced to three for his early plea. An offender’s levy of £25 was also imposed.